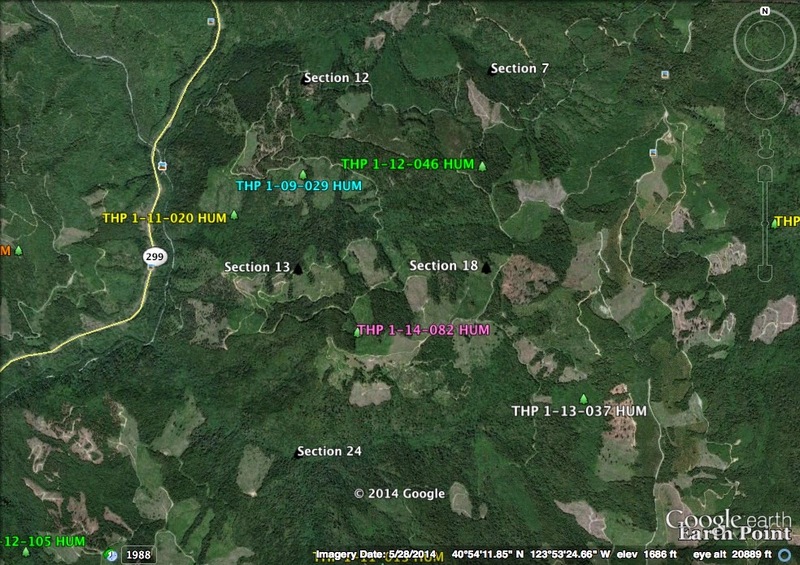 THPBlog: Green Diamond Resource Company to clearcut near Highway 299 east of Arcata, CA. Green Diamond Resource Company to clearcut near Highway 299 east of Arcata, CA. This THP is about 8 miles NE of Arcata, CA and a few miles east of Highway 299 at an elevation of 530 to 2,120 feet. Green Diamond Resource Company is planning a mostly clearcut tractor and cable logging operation in Douglas fir, grand fir, western hemlock, bishop pine, western red cedar and Monterey pine forests. The THP area flows into the North Fork of the Mad River which is listed as impaired for sediment, turbidity and temperature and contains coho, chinook, steelhead and coastal cutthroat trout. There are landslide terrain sites in units B, D, E, F and I including headwall swales, deep seated and rapid shallow landslides debris. There are also multiple misc road failure sites including washed out crossings, fill failures and cut bank failures. 30 acres of selection logging is planned adjacent to Highway 299 to hide the effects of clearcut logging. Green Diamond Resource Company wants to re-construct 3 existing road segments on unstable soils, and use heavy equipment inside a class II watercourse within unit A on the old Highway 299 spur. 22 road drainage sites are planned for work including rocking, dip construction, road bed stabilization and culvert repair/replacement. Steelhead and coastal cutthroat trout were reported within units A, B and F, and southern torrent salamanders and tailed frogs were reported within all units except unit E. Northern spotted owls were reported to be within .25 mi of units A, B, F, H, and within .5 mi of units C, E, G, I. More information is available on the THP Tracking Center website.